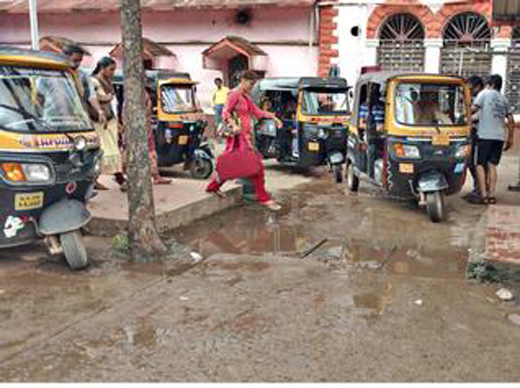 Mangaluru, June 06, 2016: At a time when the Union government and the Railway Ministry are engaged in high-voltage Swachh Bharat campaign, thousands of passengers using Mangaluru Central Railway Station are forced to wade through overflowing sewage in front of the station. Sewage has been overflowing near the prepaid autorickshaw parking lot, near the parking lot meant for differently abled persons and behind the refreshment room. Deposits of human excreta too could be seen on the overflowing underground sewage chambers. Those managing the two-wheeler parking lot said their complaints to the Railway authorities of unbearable stench were not being heard. A senior Railway official at Mangaluru Central told The Hindu that the problem has surfaced after the Mangaluru City Corporation upgraded the sewerage system around the Central Railway Station. The Railways should have connected its sewage network to the new and upgraded network of MCC, which is taking time. The divisional headquarters has approved the proposal and everything would be in order within 10 days, he said. Divisional Railway Manager, Palakkad, Naresh Lalwani told The Hindu that he came to know about the problem a couple of days ago and immediately sanctioned the proposal to connect the network. In about four days, a permanent solution would be in place, till which time, the Railways would utilise the services of sewage suckers, he said. Meanwhile, area councillor A.C. Vinayraj said MCC had nothing to do with the problems and it is prepared to offer sewage suckers temporarily. One of the main sewer lines passes through the Railway property in the vicinity of the Central Station. While the upgraded sewer lines (10” diameter) were commissioned about a fortnight ago, the Railways did not connect its lines to the upgraded line, which is about two ft below the old line, he said. Rainy season is hell to the pedestrians. In most of the roads there is no proper drainage system. No one cares about the problems . Simply make promises to public. The Politicians are least concerned about the problems faced by the people in the city. They are only suitable to criticize one another. During the monsoon the whole city seems to be flooded with the out flowing sewage along with the rain waters.